This little imitation of Jonathon Swift’s ditty helps illustrate the parallels between the atmosphere and ocean. Just as in the atmosphere, but much slower because of the increased density, turbulence in the water is expressed by meandering currents, and vortices. Good examples of this are observable when an oar is dipped into the water to push a boat, or a spoon is drawn across a bowl of soup. One of the mysteries of the SEP (South East Pacific) region is the presence of large oceanic vortices (Eddies), the mechanisms that generate them, and the length of time they persist as identifiable entities slowly spinning in the surrounding waters. In a number of coastal areas fishermen and oceanographers have discovered that some important fish species can be found associated with these so-called mesoscale water structures, like upwelling areas, meandering currents and eddies. Such links are fairly well known and heavily exploited in the vicinity of the boundary currents off eastern North America (Gulf Stream), California (California Current) and Japan (Kuroshio Current); for tuna, swordfish, sardines and anchovies. The coast of Peru and Chile is swept by the northward flowing Humboldt (Peru-Chile) Current and the area is famous for the upwelling that brings deep, cold, nutrient-rich water to the surface (and every 5-7 years when it doesn’t, El Nino conditions). Exposed to sunlight, phytoplankton utilize the nutrients to form the base of the world’s largest industrial fishery for fish meal and oil. The area also supports a large commercial tuna fishery. Poorly understood is the role of eddies that spin off the major current; vortices averaging about 50-Km (30-miles) wide (i.e. mesoscale). These may be either cold or warm water eddies that may last offshore for months, and move as discrete masses to the west. In general these vortices have more energy that the surrounding waters, circulate faster; and are important because they transport heat, masses of water and nutrients to less productive regions towards the mid-ocean. The eddies also transport marine life and the mechanisms for this are also poorly understood, however the outcome is not. 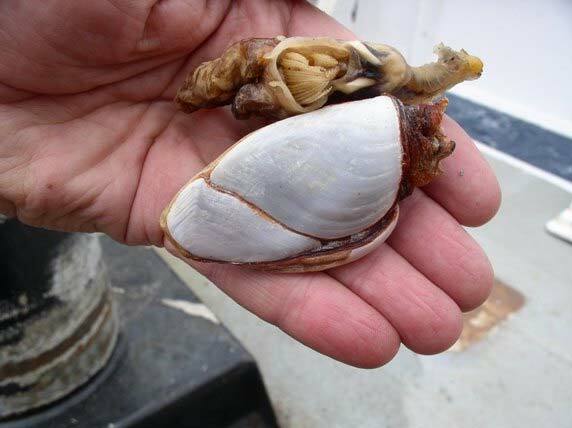 Moored buoys out here collect and support masses of fouling organisms like goose-neck barnacles that must be cleaned off periodically, along with other routine maintenance of the batteries and recording instruments. Servicing these buoys is also part of the mission of the Ron Brown. 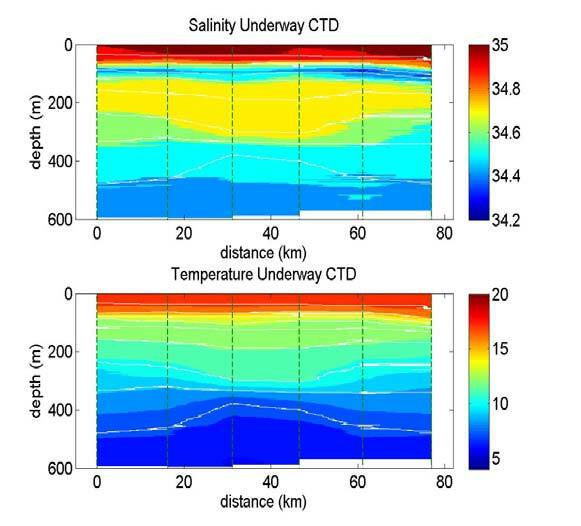 Tracking these “cyclones in the sea” requires interpreting daily satellite images that measure water temperature and by data collected by the UCTD (Underway Conductivity Temperature Depth) probe. 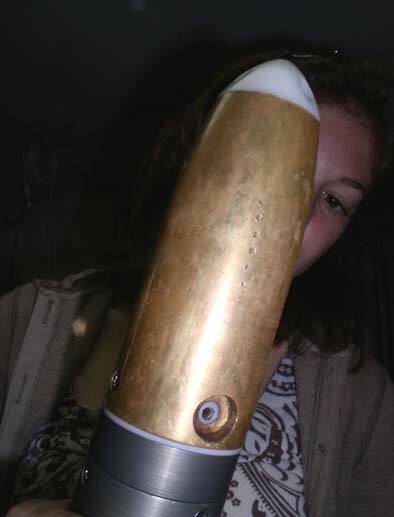 This is a torpedo-shaped device cast off the stern of the Brown while we are underway. It rapidly sinks to several hundred meters. Then, like a big, expensive ($15,000.) fishing lure, it is retrieved with an electric motor that winds back over 600 meters of line. 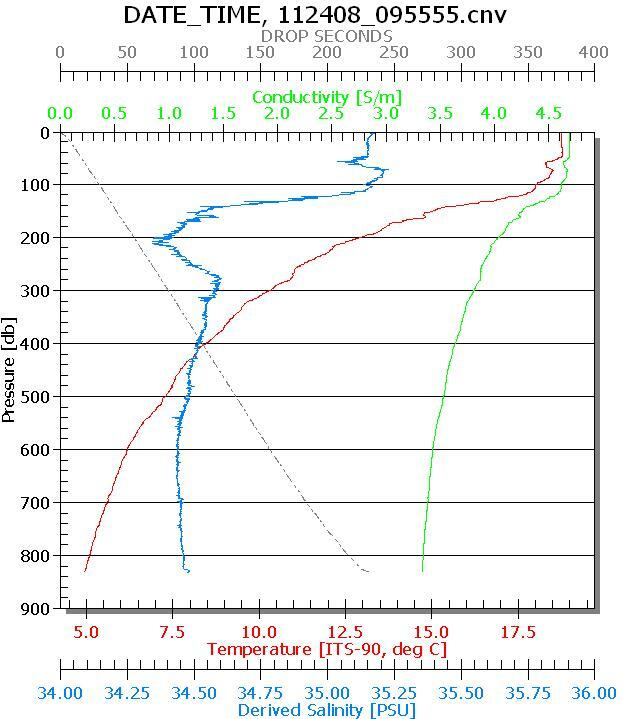 The whole process takes about 20-minutes (including the 2minute plunge of the UCTD). The information acquired is phenomenal, and if collected any other way, would involve stopping the ship and repeatedly lowering Niskin or Nansen bottles; and adding weeks or months to a cruise schedule. 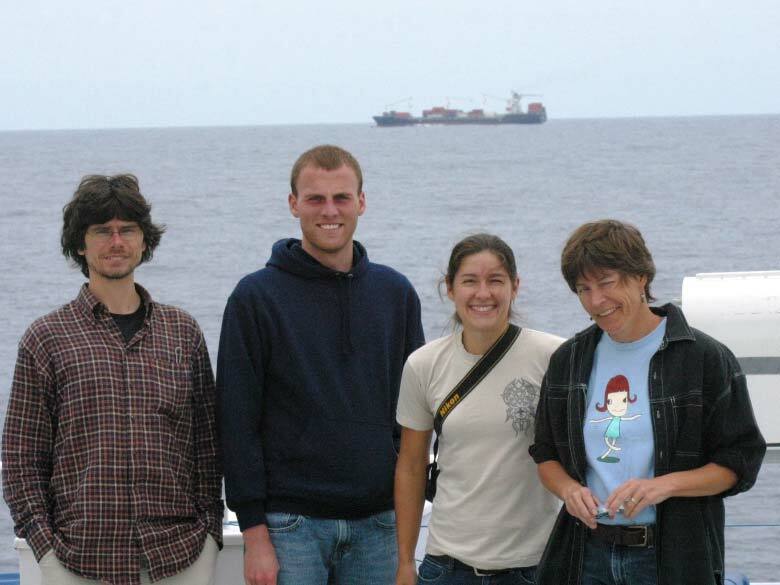 Once back onboard the ship, the data is downloaded and plotted to give us a continuous picture of the upper layers of the ocean along our sailing route. All of this hourly data allows the tracing of water currents. The procedure is not without trials and tribulations. Lines can tangle or break, and there is always the possibility that the probe will bump into something – or something will bump into it down in the deep, dark ocean. However, any data retrieved is invaluable to our studies, and each cast produces a wealth of information. Today’s weather is fabulous. Most mornings are heavily overcast, but we are still close enough to the coast to enjoy breaks in the clouds. So, everyone is taking their breaks in folding chairs on the foredeck at “Steel Beach” since we are never certain when we’ll again have a sunny moment, or how long it will last. I am still not certain what the proper ship’s etiquette is in passageways and stairways, but I am quick to relinquish the right-of-way to anyone who is carrying something, looks like they are in a hurry or on a mission, or in uniform (obviously) or kitchen staff in particular. Because the ship is always rocking, I’ve found that I tend to lean against the right wall while moving about. By lightly supporting myself leaning with a hand, elbow or shoulder (depending on the how significant the ship is rolling, pitching or yawing) I slide along the wall, and probably look like a clumsy puppy scampering down the hall, but it works…except for a few bruises here and there. Often I come face-to-face with the same shipmates repetitively during the day. (How many times a day can you say “Hello” to someone?) Everyone is polite and considerate, especially when moving about the ship, and in spite of repeatedly passing the same people many times every day. So generally, since everyone is busy for most of their shift, when meeting in the hallways, you resort to awkward routines like: muttered Hey, Hi, Yo or What’s-up; tipping your hat or a dumb half-salute; or a nod…or if from New England, what is known as the reverse nod. *Flogging: There was a science to this horrible practice, not only with the number of lashes imposed, but what they were administered with: a colt (a single whip) or a cat (They varied in size from “king size” to “boy’s cats”). 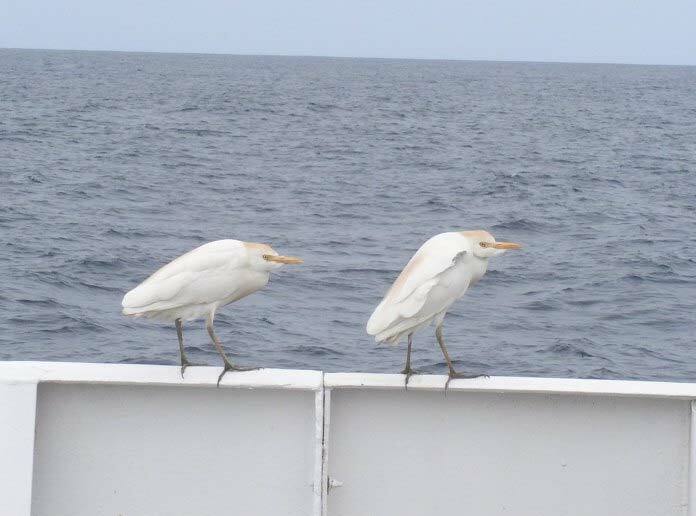 We discovered stowaways onboard…two cattle egrets. Egrets are wading birds that feed in shallow ponds and marshy areas; and the cattle egret regularly feed along roadsides and upland fields where cattle or tractors stir up insects. Even when threatened, they tend to fly only short distances, so it is odd to see them so far from land. However, in the 1950’s a small flock of these African birds crossed the South Atlantic to Brazil and establish a breeding colony. I remember spotting them for the first time on the Mexican border near Yuma in the 1970’s and today they have managed to thrive and spread all the way across the warmer half of North America. 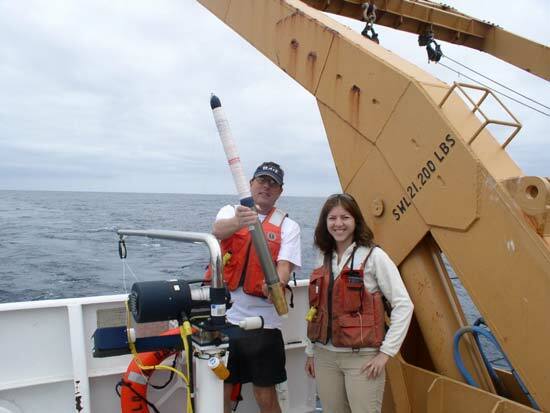 This entry was posted in 2008, Dave Grant 2008, NOAA Research, NOAA Teacher at Sea and tagged anchovy, barnacles, CTD, fisheries, noaa ship ronald h brown, oceanographic processes, seabirds, southeast pacific, tuna, upwelling. Bookmark the permalink.